TV Talk: SANDRA OH'S ‘GREY’S ANATOMY’ EXIT—IS THIS THE BEGINNING OF THE END? SANDRA OH'S ‘GREY’S ANATOMY’ EXIT—IS THIS THE BEGINNING OF THE END? The announcement of Sandra Oh’s exit from GREY’S ANATOMY at the end of the show’s tenth and forthcoming season created waves on Twitter just a few hours ago. This revelation shocked many, not long after we learned that the remaining members of GREY’S ANATOMY’s original cast might not return to the show after its forthcoming season (after which their current contracts expire). Of the original cast members that are still series regulars, most were confident that Ellen Pompeo (Meredith Grey), Justin Chambers (Alex Karev), Sandra Oh (Cristina Yang), Chandra Wilson (Miranda Bailey) and Patrick Dempsey (Derek Shepherd) would return, leaving James Pickens Jr as the only question mark, as his character (Richard Webber) was left electrocuted and unconscious at the end of the show’s ninth and most recent season. The revelation of Sandra Oh’s exit probably came as such a shock to everyone because we were all expecting James Pickens to be the one who would leave, if any of them would anytime soon. The latest information about the fate of the original cast on the show brings to the forefront the question that has been on most of the fans’ minds for a while now—what becomes of the show if any of the ‘originals’ leave. However, to me when it comes to the ‘originals’, it refers more to the original set of interns on the show than to the original cast members… Meredith, Alex, Cristina, Izzie and George were the original five interns whose stories as fresh medical professionals brought us into the series to begin with, as their professional and personal growth became the focal point of the show. Over the years, actors have left the show and new actors have become a part of the hospital’s employees, even as the hospital itself has seen several changes. By the end of the show’s sixth season, two of the original interns—George O’Malley (TR Knight) and Izzie Stevens (Katherine Heigl)—had left the hospital. While Knight left the show at the end of its fifth season because of his character not having enough of a role, Heigl left during its sixth season for personal reasons. That left just three of the original interns whose stories that have formed an integral part of the show. The unknown fate of the actors playing those interns, along with the other original cast members, raised a question over whether or not it would make sense for the series to go on without them. Some feel that the show cannot go on without the titular Meredith Grey, while others argue that the renaming of the hospital as ‘Grey-Sloan Memorial Hospital’ paves the path for the show to go on even without Meredith, if it had to. Many have said that without the hospital’s ‘patriarch’ (James Pickens Jr’s) Richard Webber, the show would feel empty. However, I personally feel that the show would feel truly empty if the rest of the original interns are not a part of it any more. To me, GREY’S ANATOMY has been less about Meredith Grey and more about the original interns, whose foray into the world of surgery started the show. What becomes of them is what forms the core of the series, even as we see the evolution of the many other characters around them. One died (George) and then another left the hospital and her personal relationships (Izzie). For three years after that, we’ve seen the remaining three evolve, growing through ‘the surgical food-chain’ as professionals, and dealing with several personal challenges as well. Now, with the departure of Sandra Oh, another original intern is about to leave, with just Meredith and Alex left. And that spells ‘the beginning of the end’ to me. And I think that when Meredith and Alex also eventually leave the hospital, it would be the time for the show to end. I’m not saying that GREY’S ANATOMY should end soon. If it will have taken ten seasons for three of the original interns to leave, it could definitely take a few more seasons for the remaining two to leave. 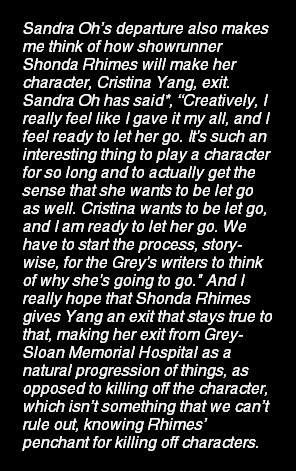 What are your thoughts on Sandra Oh exiting GREY'S ANATOMY? Do you think this is 'the beginning of the end'?